Mediterranean diet has added one more feather to its cap. From helping ward off diabetes and high blood pressure to accelerating weight loss and beating depression, many know about the incredible health benefits of the Mediterranean diet. Now a study by US News and World Report has adjudged the diet as the best overall diet of 2019. For the study, they conducted a survey of 41 diets. The Mediterranean diet scored the top rank as the best diet for healthy eating, best plant-based diet, the best diet for diabetes and the easiest diet to follow. The DASH diet, which stands for Dietary Approaches to Stop Hypertension, came second in the overall ranking. Last year, DASH diet was the tops scorer. The DASH diet is not only meant for existing patients of hypertension but also for people who have a family history or high chances of developing it. The third slot was bagged by the Flexitarian diet which refers to flexible + vegetarian diet in which you don’t have to eliminate meat completely to reap the health benefits associated with vegetarianism. The idea is to be vegetarian most of the time, but indulge in meat occasionally. Mediterranean diet is rich in fresh fruits and vegetables, olive oil, fish, nuts, legumes, whole grains and other healthy ingredients all known to provide ample benefits to the body. 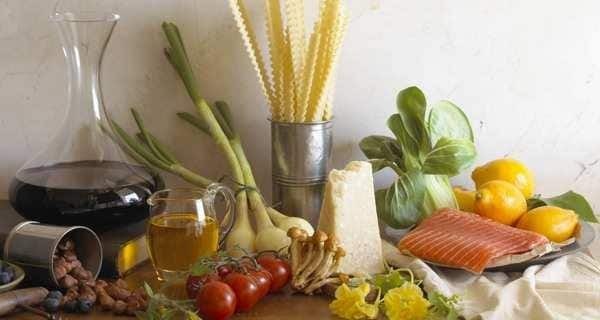 The foods of a Mediterranean-type dietary model, which are able to offer the maximum health benefits include high consumption of monounsaturated fats (widely present in extra virgin olive oil) and fish, but also a moderate consumption of alcohol, preferably during meals. The Mediterranean diet focuses on increasing intake of plant-based proteins, healthy fats like eggs, flaxseeds, nuts and oily fish like mackerel, tuna and sardines and whole grains, vegetables and fruits. Some of the health benefits of the Mediterranean diet include lowering the risk of heart attack and stroke, improving the digestive health, reducing the risk of inflammatory diseases and cancers like breast cancer. Mediterranean diet is also great for older people as it slows ageing because it has antioxidant, anti-inflammatory properties, reduces the risk of frailty in older adults and improves gut microbial diversity and is therefore associated with a lower risk of hospitalisation in liver cirrhosis patients. Mediterranean diet also helps maintain a healthy blood supply from the aorta in the heart to the groin thereby improving blood circulation in the area and ensuring optimum functioning of the sexual organs. This helps prevent sexual health conditions like erectile dysfunction. Mediterranean diet is also famed for its ability to ward off diabetes.